Come to this Irvine Spectrum hot-spot for imaginative sushi rolls, classic sushi, shabu shabu and an all-you-can-eat buffet. 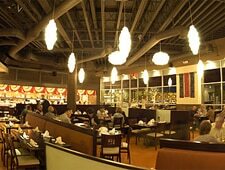 : Maki Maki is a modern Japanese sushi and California fusion restaurant in the bustling Irvine Spectrum Center. Located across from Yard House and the Irvine Improv, Maki Maki has a large sushi bar where traditional sushi chefs give guests a show with verbal antics and pleasing presentations. There’s also a long list of specialty rolls (about 50), most of which are flavorful and satisfying. Of course, you can order up sushi at your table as well as carefully-prepared meat dishes that don’t fall into the spectrum of traditional Japanese cuisine. Some come for the inexpensive all-you-can-eat, made-to-order sushi on Thursday evenings (6 p.m.-10 p.m.) and Saturday and Sunday afternoons (11 a.m.-2:30 p.m.).